Romeo and Juliet may be the last place you would look for a literary inspiration for Satan, and I don't think it was one for Milton (we can't completely rule out the possibility, but I think we can safely agree it is considerably less likely than England winning the World Cup). But looking at this famous quote gives us a number of interesting ways of thinking about Satan's character in Paradise Lost. Satan used to be one of the most important of God's angels, but rebelled when God declared the Son to be above all the angels in glory. Satan persuaded a third of the angels to rebel with him, and declared war on God. 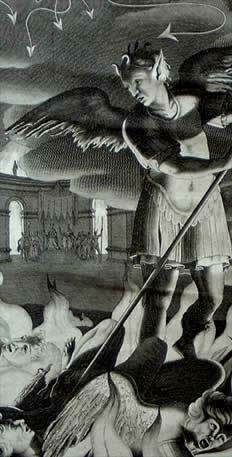 Satan was defeated by the Son and cast into Hell with all the other rebel angels. 'Lucifer' means 'light-bringer' in Latin, which is not far away from Shakespeare's 'bright Angel', but 'Satan' means 'the adversary' in Hebrew. In fact, he is first described to us in Paradise Lost as 'the arch-enemy, | And thence in heaven called Satan' (I.81). He is defined only by his opposition and relation to God and is often presented with reference to his former beauty: 'the excess | Of glory obscured' (I.593). We are never allowed to forget that he was once a glorious angel of God, good rather than evil. We are constantly reminded by the 'bright angel' motif that Satan was created by God, but then opposed him; a failed creation, if you like. We are led to St. Augustine's idea that evil is not an essential attribute, something existing in itself, independent and exclusive from that which is good. Evil is rather something chosen, acting through free will in conscious opposition to God's will. The allure of free will is where the attractiveness and power of Satan's character lies. Satan may be quite useless when it comes to fighting the ten thousand thunders of Christ's fury, but in his will he is free and in his mind he is supreme: 'What though the field be lost? | All is not lost; the unconquerable will' (I.105). Satan was defeated but not defeated, or to draw a slightly blasphemous parallel to Saint Paul, he was 'perplexed, but not in despair; [...] cast down, but not destroyed' (II Corinthians, 4.8-9). We may indeed argue that he (Satan, not Paul) is deluding himself when he preaches 'the mind is its own place, and in itself | Can make a heaven of hell, a hell of heaven' (I.254) - this is a clear case of sour grapes; Satan is exiled from heaven and pines for lost joys. But in hell, Satan is sovereign and free from having to worship the Son. When Satan comes into Eden, he is tormented by 'the hot hell that always in him burns' (IX.467). One may choose to read this as the narrator's sardonic comment on Satan creating 'a hell of heaven', but this mental extension of the physical torment of hell as well as trapping him, also in a way represents Satan's freedom: this is a hell of Satan's own choosing and creation, caused 'in him' by his hate and envy of everything good. Satan's mind is not only unconquerable and unconditionally opposed to God, it also influences other minds to use their free will to oppose the will of God. And this is where the 'speak again' of the opening quotation needs to be considered. Speaking is what Satan does extremely well; his speeches in the first two books of Paradise Lost are a rich store of quotes for any motivational speaker. We must never forget that the two major events of the poem are created through the persuasive speech of Satan - he convinces the angels to take up arms, and convinces Eve to eat the fruit. In the former achievement he takes a third of the heavenly host with him, in the latter he takes the whole of the human race (or so he thinks until Christ spoils his party). Satan is charismatic, eloquent, and unanswerable; the bright angel speaks again and again, tempting with knowledge, tempting the reader, as he tempted Eve, to think, question, explore, reinterpret, and to eat of 'this intellectual food' (IX.768) and 'make wise' (IX.778), to be won over by the power of the free-willed mind and make it 'its own place'. In Books I and II, Satan's speech dominated the narrative, and the action of the poem stopped while he had his say. Now the words of the narrative swallow him up - 'to serpents all as accessories' (X.520). The sibilant 's' sounds of this description mockingly imitate his speechless hissing. Satan has been silenced completely and humiliatingly for the rest of the poem. It seems to me that the only way to give God's life-giving word prominence is in a monologue. Satan's speech must be silenced, as its immense power over the poem and the reader is too attractive and too great a competitor. There is only room for one king at the end of this poem, one majesty, one talk.